Browsed through some of your thesis, looks quite interesting. Also a lot of work, good job. Thanks, I have to give my professor a lot of the credit. He put a lot of emphasis on being clear and concise. I can barely imagine how much time he must have put in reviewing it. Even though I'm not sure it was really up to his standard, but I guess it was passing. I felt I learned a lot and gained a respect for him. I also gained a lot of respect for teachers in general after being one for a short peroid of time. I found simple diagrams and images really help and how useful Microsoft paint could be. OK, quick recap of the thread and what I want to try to figure out. - A dipole antenna resonates at a specific frequency due to a standing wave which has the majority of the electric field at the ends and mostly magnetic field in the center. - An "end fire" antenna array consists of dipoles spaced a quarter wavelength apart, with signals 90 degrees out of phase. - A two element "end fire" antenna will radiate an electromagnetic wave in a single direction due to additive effects one way and subtractive effects in the other direction. - I came up with this same idea around 2003-2004ish but never did anything with it, it's always kind of bothered me though. I was starting a build to see if I could figure out what is up with this and then found this thread. Maybe somebody else already knew? Did someone else already build? Could I save myself some time? - Does this produce an overall thrust? My gut feeling is that the answer is no. (Each individual element in the array does not radiate anything directionally so adding two elements will not radiate anything directionally) But what if it did? - What kind of radio antenna would this result in? This configuration appears to attempt to radiate the electric field in one direction and the magnetic field in the other. Not sure what would happen here. - What happens to the force if it does not produce a thrust? My best guess is that the force gets applied from one element to the other in such a way that it would prevent the dipole from resonating in the first place meaning that a standing wave never develops. 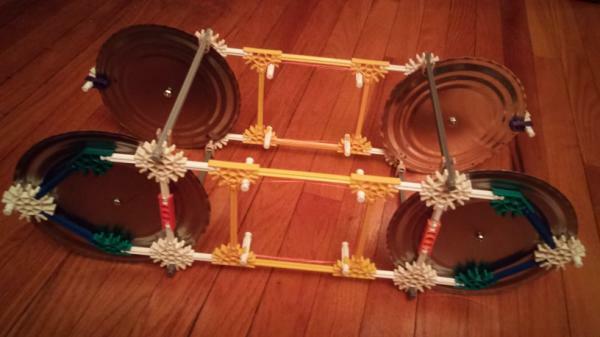 But I haven't done the math on this, very complicated, easier to just build and test. - How is momentum conserved? I don't actually think this will exert a force so I think momentum will be conserved just fine. If it does though, I will let the physics people figure out where the momentum goes, and I'll go back to my electronics. I still don't understand the situation you are describing, since when current stops, this would not mean that their would be a charge separation like in a capacitor. For most wires, there is no separation of charge generated at all when current flows through them, so no stopping point would produce a charge separation. For some antennas, the antenna temporarily acts as a capacitor, and has a charge distribution in it (charge flows in, but has nowhere to go) But this is oscillating as you apply a signal, and when you stop applying a signal, the natural state is for it to be a uniform (zero because it is balanced by the nuclei in the wire) charge distribution. If you kept applying a constant voltage so that it acts as a capacitor, you would want to also consider the balancing charge, which most likely is on the other side of your constant voltage source. It makes sense to me, though I didn't go through it too closely. One thing that is helpful if you haven't heard of it before is Jefimenko's equations. The standard formulation of Maxwell's equations is useful to show some properties of electromagnetic fields, such as the fact that a changing electric field cannot exist without there also being a changing magnetic field and vice versa. Jefimenko's general solution to Maxwell's equations shows that all fields originate from actual charges. 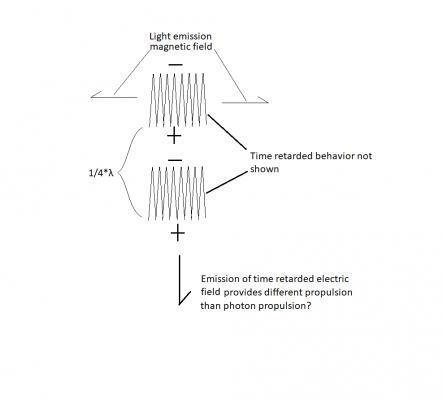 Notably, the terms in the equations are all related to the "retarded position" of the charge or current, which shows that every relevant bit of information is delayed by the speed of light. You can also see which terms are related to the velocity or the acceleration of charges. Magnetic field has just 2 terms: Current density, and rate of change of current density. If you look enough, there must be at least half a dozen threads on this site where someone has come up with some variant of this idea, most have been locked for various reasons, and some it took a while for the OP to explain enough about their idea to make it clear that it was just another variant of a small phased array. Probably, this is a 2 element phased array, and with proper phasing, it should produce a directional pattern. Phased arrays are used all over the place. Radars are one common use, the new satellite internet constellations use phased array for electronic beam steering, and even some home wi-fi routers use a couple of antennas to increase signal strength towards specific devices. The existence of momentum carried by radiation is well known, tested, and understood, but generally useless and difficult to measure due to power to force ratio. When this is discussed for propulsion purposes, lasers are typically considered, because RF phased arrays are not nearly as directional as a laser. No, it doesn't, radiation simply doesn't work that way simply based on the dE/dt and dB/dt terms in Maxwell's equations. I am not sure how you are getting to this conclusion. N/A if configured to radiate in a direction, then there is a matching net force, if configured to produce a symmetric radiation pattern, then the net force is zero. The problem with skipping the math is that you almost certainly will not be able to measure force in the asymmetric radiation case, because the force is too tiny. You can measure the field patterns though. My last post was more just a synopsis of the thread in general. Good responses. - Lorentz forces between elements (near field factors) will act on the circuit itself and not add to any radiation. I'll still go through some of the math for this at a later time, and will probably still build something, but I won't put a huge amount of effort into it. Thanks for helping me get a better grasp of the physics. For must low frequencies there isn't charge separation but at higher frequencies on the order of microwaves the current has a wavelength in which charge is flowing back and forth between the nodes. When current stops flowing at the nodes, it is frozen in time for a second as separated charge, then flows back. Resonance maintains this behavior. So I look at the static electric field as separate from the magnetic field in that the electric field describes the non-relativistic nature of the electric field, while the magnetic field describes the relativistic nature of the electric field. The two combined are the fully relativistic electric field. Physicists found early on it was helpful to separate the fully relativistic electric field into the electric and magnetic field. By accounting for the electric and magnetic field they account for the fully relativistic electric field which can transform based on relativity. It is this radiation pattern that Purcell derives in his book "Electricity and magnetism" for an accelerated charge that alerted me that the Biot-Savart equation also describes such a radiation pattern from a single charge. If light is described by the Biot-Savart equation which is the (magnetic field) of a single charge then this separates light from its (electric field). The charges static or non-relativistic electric field can also vary in time as charge is separated in time in a wire. This electric field is very different from light (magnetic) because the electric field points toward the charge while lights electric field points in the direction of the charges acceleration. This makes its electric field perpendicular to that of light so they are different beasts. What is interesting is that in a phased array the propulsion of the magnetic field is opposite of the propulsion of the time retarded electric field. Yet we still get photon propulsion out of this. 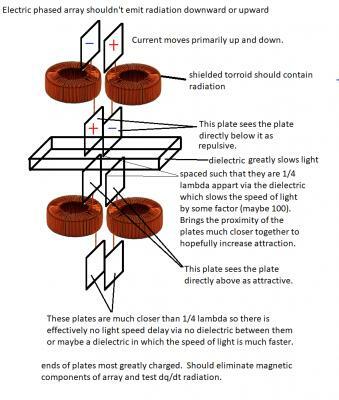 If the magnetic field is light then I guess what I am really interested in making an electric field array which should emit a strange form of electric field in the direction in which no light can emanate. In the direction in which charges are accelerated. See image below of electric field phased array. Not a light emission phased array. Aha, these are the equations (Jefimenko's equations) I wanted to take a closer look at. I was reading through something that used these to describe the near and far fields of a radiating antenna, but then they just ignored the near field terms. I don't know what low frequencies you are talking about, but microwaves are fairly low frequency as far as EM radiation goes. In general for anything in the radio wave portion of the EM spectrum you can just scale your antenna with the wavelength of what you are working with. If I am understanding you right, you are just referring to the instant when the current equals 0. At this same instant is when the charge density term in Jefimenko's equations is the maximum, and also when the dJ/dt rate of change of current density term is the greatest. This is the term that results in electromagnetic radiation. Biot-Savart only applies for steady currents. In those cases it is just the first term of the magnetic field in Jefimenko's equations, without the need to worry about retarded time and position. The second term is where the interesting actual radiation comes from. I still don't see how you can be coming to this conclusion. The actual fields that carry any significant distance from an antenna array of any design are the dJ/dt terms in Jefimenko's equation. The dq/dt term looks like it would result in 1/R as well, but that goes away at far distances, because the charge distribution is that of a dipole. I don't understand how to read that diagram, I don't know what the zig zag lines are supposed to be. Are you proposing an actual wire in the shape of a zig-zag? Is it supposed to be a coil? Something entirely different? In either case, more dimensions are needed than the distance from one zig-zag element to the other. I think you are right here. The density of the separated charge should normally be small. One would need to separate more charge to get the desired charge density to intensify the charge separation. Possibly by increasing the capacitance in the wire. I am thinking a series of wires that have capacitors between them but then this causes the electric field to be contained between them. I still need to look at Jefimenko's equations but I think from what I have read here he has the near electric field in his. I am guessing he should also have a sum of that near electric field (not light) that is summed from infinity that would drop its electric field at 1/r but your right the low charge density and its charge distribution is a dipole so in the end I think it does drop rapidly. Still a magnetic field is also a dipole and yet its radiation electric field goes as 1/r so I wonder. I wonder if it could at all be related to quadra-pole radiation - Ill have to think about it. Well, what I mean is the sum from infinity of the Biot-Savart equation that gives light. When the magnetic field changes. I see where your coming from. Your asking if its even significant. I honestly don't know if it can be made significant now that I think about it - the density of dq/dt. Good question. I question if the dq/dt term actually drops away as a dipole or not because the magnetic field as a current loop is also a dipole and yet its light field doesn't drop as a dipole. If the change in the dipole magnetic field drops as 1/r when summing the disturbance from infinity then I wonder if the dq/dt term may also possibly drop as 1/r. Not sure that makes a lot of sense but I wonder. There is also the fact that the magnetic field of a single charge drops off at 1/r^2 so its change as a sum from infinity drops as 1/r but for charge separation dq/dt in a wire charge always comes in pairs so it might not be possible to consider the field as 1/r^2 even though were considering dq/dt radiation of a single charge at near field. Sorry, the diagram is of wires where the wavelength of radiation is of the order of the wires length. There is a dq/dt term indicated on the wires. To be honest I think the frequency term or some capacitance needs to be there to enhance how much charge is actually separated. By introducing capacitors I wonder if there might eventually be a quadra-pole term. I also thought that capacitor plates at the endpoints of the wire would be a good idea. Already included these in my build. I think that these would enhance charge separation and maybe add a bit more directionality to the electric wave. More importantly it will make the driver circuitry easier to build since the capacitor-inductor-capacitor model will be a naturally tuned circuit. I would be curious to see a picture if you get to a point where you think it is photogenic. Just out of curiosity and that a picture has a lot to say about what to possibly expect. Here is my test build so far, no electronics yet. Wanted something easy to reconfigure as there will likely be a bunch of changes when I start adding oscillator circuits, changing the length between elements etc. But this will give you an idea where I'm going with it. I haven't been able to draw a diagram yet but this relates to my intuition that a pure electric (non-magnetic) phased array might be made to be quadrapole. I was trying to think of a phased array that only projects dq/dt in the direction of propulsion so that no one could say it was magnetic or normal radiation propulsion. If it works the radiation would be quite strange as the electric field would point toward or away from the array. With normal capacitor plates the charge has to fill the plate and if from the center you still get magnetic terms with current. I came up with the idea of four strips side by side connected and fed by a torroid. The four strips aren't really time delayed with respect to the frequency so they are much closer than 1/4 lambda. Between this set of strips there is a dielectric that makes the next set of 4 strips spaced at a distance of 1/4 lambda. The strips spaced by the dielectric act as a phased array while the 4 strips with out dielectric act as capacitor inductor systems. The magnetic radiation should be perpendicular to the direction of propulsion while the dq/dt radiation should be in the direction of propulsion. ill draw a diagram later. Gota run. You don't have to do this. It's just something I was pondering. Thought you might find it interesting. The flat plates closer than 1/4 lambda were used to increase the separation of electric charge. The circuit was made to resonate to increase the amount of energy stored in the circuit for charge separation. The ends of the plates are made to be attractive/repulsive to the the ends of the plates on the other side of the dielectric (so the current in the top circuit is 90 degrees out of phase with the current in the bottom circuit). I was thinking MHz frequencies if possible and the dielectric shortens the wavelength to microwave wavelengths. Something else to watch out for. A phased array's antenna components naturally all want to reflect radiation. If they do this then it won't be a phased array. Positive work has to be done on the antennas in the direction you want the radiation to transmit. The antennas that cancel the radiation actually need to do negative work. That is the electrons in them need to move with the incoming electric field but encounter resistance in the wire. I think the trick is making sure that the current is actually 90 degrees out of phase between the elements, instead of operation in their reflective mode. That the current is actually behaving as it should might require monitoring of current. To accomplish this there needs to be adjustment of voltages on each element. It's similar in the electric phased array above. If a plate sees the plate below as repulsive it has the same charge. This reduces the plates effective ability to hold charge. More voltage is required to store the same amount of charge on that plate. if the plate below sees the other plate above as attractive it has enhanced ability to store charge. Less voltage needs to be applied to store the same amount of charge. So there's this reoccurring theme of positive work on one side, negative work on the other. Yes, I was looking at this the other day and came to the same conclusions. Both elements will have to be driven and out of phase by 90 degrees. But I came to the same conclusion that one element would reinforce the signal and the other element would resist the signal.